As I thought about my “next step” during my senior year at Northwestern University, pursuing a fellowship seemed like a good option. It’s not like I totally understood what a fellowship entailed – but many professors, career advisors, and Northwestern alumni encouraged undergraduates to apply. 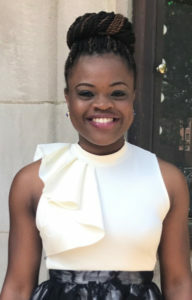 I researched the different fellowships on Northwestern’s website and admired the varied experiences that a fellowship could offer. From positions focused on research, medicine, politics, social innovation, teaching, and even travel, a fellowship guaranteed job security, professional development, and practical learning opportunities that other jobs did not. After reviewing my resume and thinking about the fields I felt most passionate about, I decided to apply for fellowships in the education and social-impact sector. I basically lived three different lives during my final year at Northwestern. From July – November 2016, I studied abroad in Sydney, Australia; from January – June 2017, I returned to campus; and from late June – August 2017, I volunteered in Jukwa, Ghana. It was unusual to choose to study abroad during my senior year, especially because of the significant emphasis placed on making memories on campus and checking off college bucket list items, but, instead of taking the traditional route, I decided to pursue my dream of visiting Sydney. I figured that the people and the campus would be the same once I got back. I also had no idea when I’d get another chance to live in Australia for 5 months! While many students I knew began looking for jobs in the fall of their senior year, I returned from my amazing study abroad experience and started job hunting in February. Still adjusting to campus life and being back in Evanston again, I applied to a few fellowships but didn’t feel particularly enthusiastic about any of the opportunities. But when I learned about the FAO Schwarz Family Foundation Fellowship right before spring break, I started to get excited. Not only did it appeal to me the most out of all the positions I had considered at the time, it was in my hometown of New York City (which meant no crazy apartment hunting for me!). I decided to apply. By that point, I had been offered two other fellowship positions, but after weighing the pros and cons, I decided to turn them down. I continued to look at job openings at different non-profit organizations all over the country. Time flew by and I started to get discouraged; nothing seemed very promising. Knowing I didn’t have a job yet, a friend encouraged me to spend my summer volunteering. I applied for a 9-week service-learning program in Ghana and reasoned that I’d have more time to focus on job hunting upon my return. With June quickly approaching, I grew more and more excited to celebrate the completion of my undergraduate career – but the future scared me. It took time for me to accept my decision to postpone my job search because it didn’t seem like the “right” thing to do. My student loan servicer had started sending me emails in October, and those gentle reminders were not going to just disappear because of my unemployment status. Finally, I decided that, annoying emails aside, I didn’t want worry to distract me from enjoying the last few months of school and the time I spent celebrating with my family. June came, and the excitement and insanity of graduation week filled the air. I needed to attend four different ceremonies, accommodate family members, move out of my dorm room, go to a study abroad orientation, and pack for Ghana. I was exhausted! That week, much to my surprise, I also got an email from Jumpstart, an FAO Schwarz Fellowship non-profit host organization, asking to schedule a phone interview. Although hesitant to begin an interview process right before my trip, I said yes and hoped for the best. During our conversation, I explained that I’d be leaving the country in a few days. Because we planned to work in a remote part of Ghana, I expected to have unreliable phone and internet access throughout the summer – I felt disappointed that another potential job that looked promising seemed to be passing me by. Already resolved to thank Jumpstart for the opportunity and withdraw my candidacy, I bubbled with enthusiasm (and gratitude) when they agreed to expedite my interview process! I got the job offer a week after I arrived in Ghana. A load, which I didn’t even realize I carried, finally lifted. Getting a great job helped me to fully enjoy the new people, food, and culture in Jukwa. After I returned home, I had a three-week break before I started my Fellowship, and I took that time to process my last few months. A sense of peace and deep happiness overwhelmed me. I felt relieved that my next big life transition would occur in the comfort of my own home. September 5th, 2018 will mark one year since I started working as Jumpstart’s FAO Schwarz Fellow. I split my time between two departments: Field Operations & Strategy (FOS) and Policy & Government Relations (PGR). 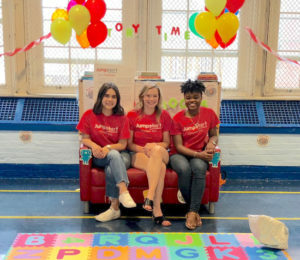 As part of FOS, I coordinate and deliver Jumpstart community events in Brooklyn and Queens, including literacy fairs and family workshops at local libraries, preschools, and community centers. I’ve planned and hosted 26 events since I started last September. Jumpstart for a Day (JFAD), my biggest family literacy event of the year, attracted 200 children and parents. The community engagement team and I took months to plan JFAD; we were elated to see our hard work pay off! Working with PGR, I research and write memoranda to strengthen Jumpstart’s public policy strategy; invite and host local, state, and federal elected officials at community events; participate in early education advocacy coalitions; and prepare public awareness and communications materials. 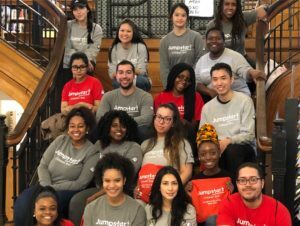 This past year, I helped to write an application to the New York City Council that secured $325,000 in funding for Jumpstart programming through City’s First Readers, a City Council initiative with the goal of partnering non-profits to implement community-wide literacy events for young children. 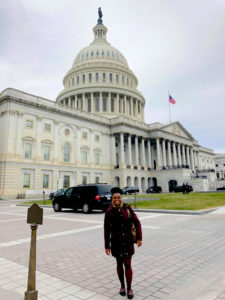 I visited Capitol Hill and met US Representative Hakeem Jeffries, who represents my home neighborhood in Brooklyn, when I attended the National Association for the Education of Young Children’s Public Policy Forum in March. It was awesome to ride with Rep. Jeffries in the “Members of Congress” elevator on my first trip to the Hill! This past year taught me that if an opportunity is meant to be yours, nothing can stop it from coming to pass. Being a part of the FAO Schwarz Fellowship and Jumpstart’s network has connected me with energetic children, wonderful coworkers, kind supervisors, and a supportive fellowship cohort. It’s been an amazing first year, and, despite the crazy journey I took to get to this moment, I wouldn’t change a thing about it. 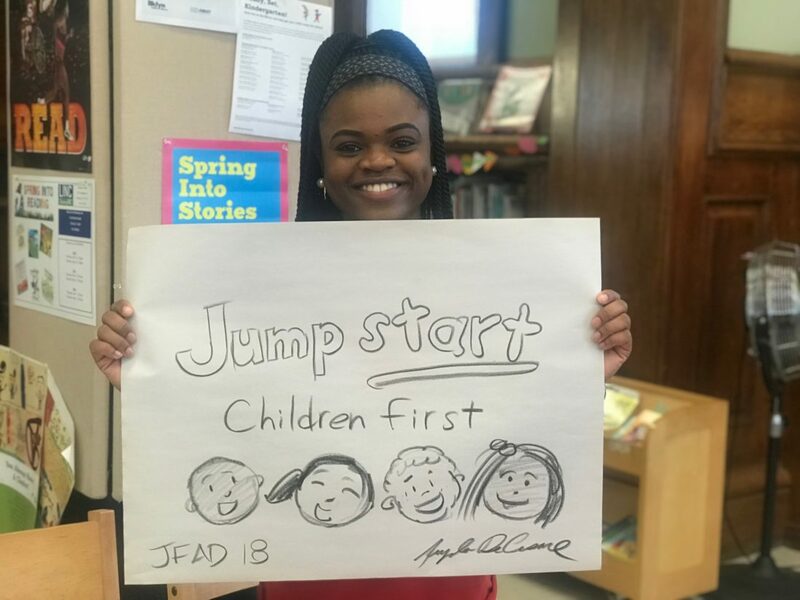 Kayla Jones is the FAO Schwarz Fellow at Jumpstart in New York.